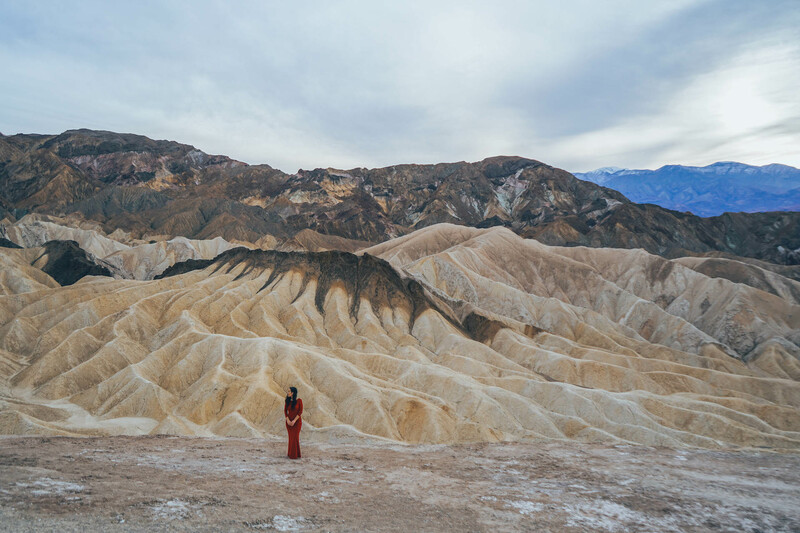 California has no shortage of beautiful national parks, but a truly special and quirky one that you must check out is Death Valley. After a mere 24-hour visit to this strange place in the northern Mojave Desert with its harsh desert climate, unique history and varying topography, I fell in love. As much as 91% of this park is considered a designated wilderness area, and Death Valley is recognized by UNESCO as an International Biosphere Reserve because of its unique ecosystem. The Timbisha Shoshone tribe has also resided in the heart of Death Valley for more than 1,000 years. 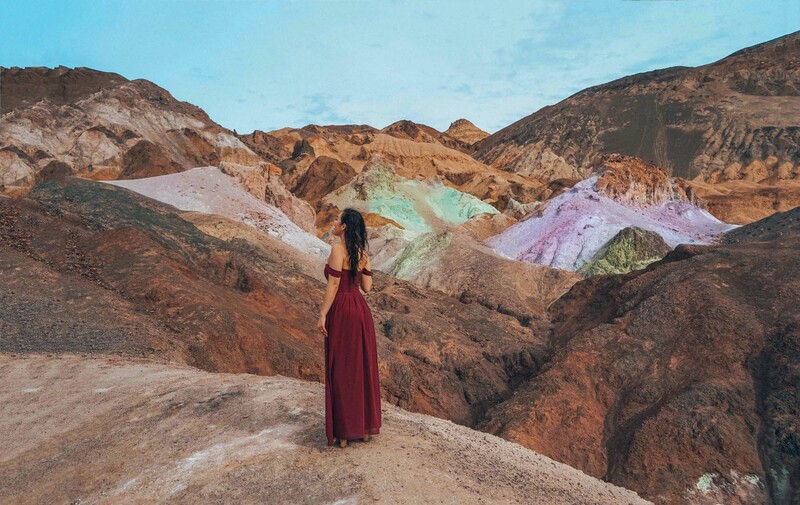 This otherworldly destination has everything from Wild West ghost towns to crazy mineral deposits in mountains that make your surroundings feel like they were splashed with a paintbrush and are more vivid than you can possibly imagine. Death Valley is also an incredibly beautiful place to stargaze. 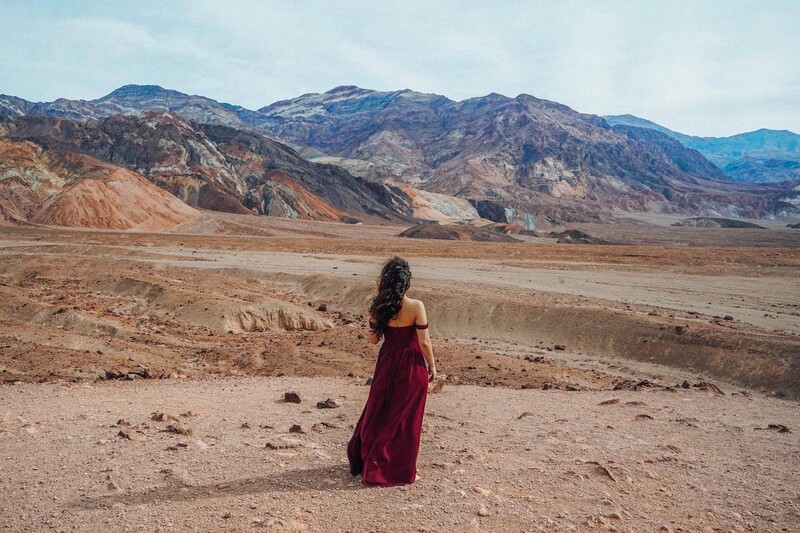 While this park is definitely something you must visit if you’re in California or Nevada (it borders both), there are some key things to keep in mind when you are planning your trip to Death Valley. This should be no surprise given the name, but Death Valley is one of the hottest places on earth! In 1913, this valley had a record world high temperature of 134 Fahrenheit (56.6 Celsius). If you visit, be sure to pack lots of sunscreen and water, and check the weather before you go. We visited in January, which was a lovely (if not slightly chilly) time to go with an average high of 67 F/19 C. I would highly recommend visiting between November and March, and am begging you—please do not try to go during the summer months of May-September (high of 117 F/47 C!). Not only will it be incredibly hot, but a lot of facilities and restaurants may be closed due to the extreme heat. It is much more temperate and enjoyable to visit between November (high of 77 F/25 C) and March (high of 82 F/27 C). 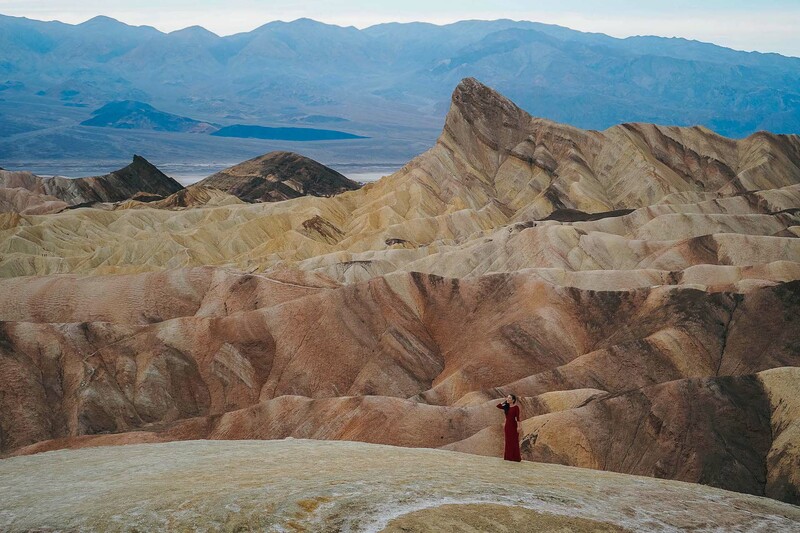 At 3.4 million acres, Death Valley is the largest national park within the contiguous United States (the four that are technically larger are all in Alaska). Driving from one popular spot in the park to another could take you 2+ hours, so make sure to plot out your points of interest wisely! 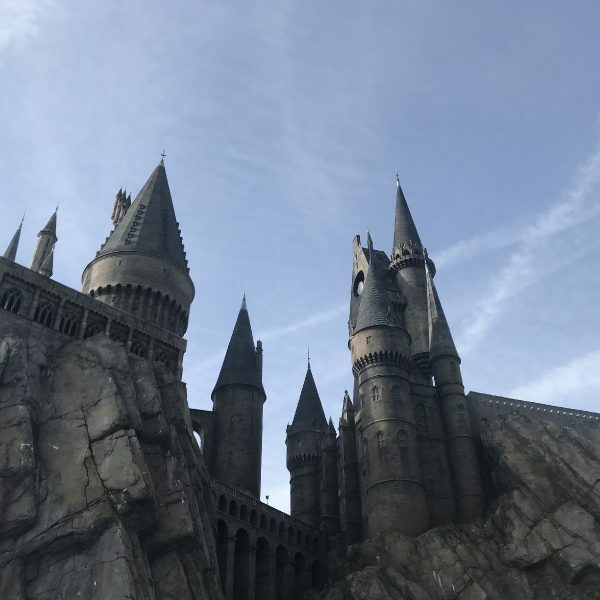 During our 24 hours here we missed some spots we would have liked to see, but it was worth it to spend more time in the places we selected (and now we have more sites to discover the next time we visit!). 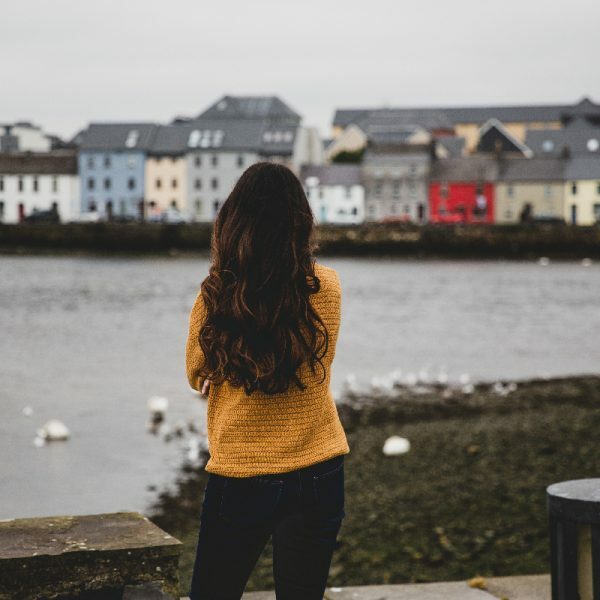 From salt plains to towering snowy cliffs and volcanic ruins, there’s something for everyone here. On the same note of how large Death Valley is, you must be conscientious of how far it is from civilization as well. It’s nearly a 4-hour drive from Los Angeles to Death Valley, and about a 2-hour drive from Las Vegas. 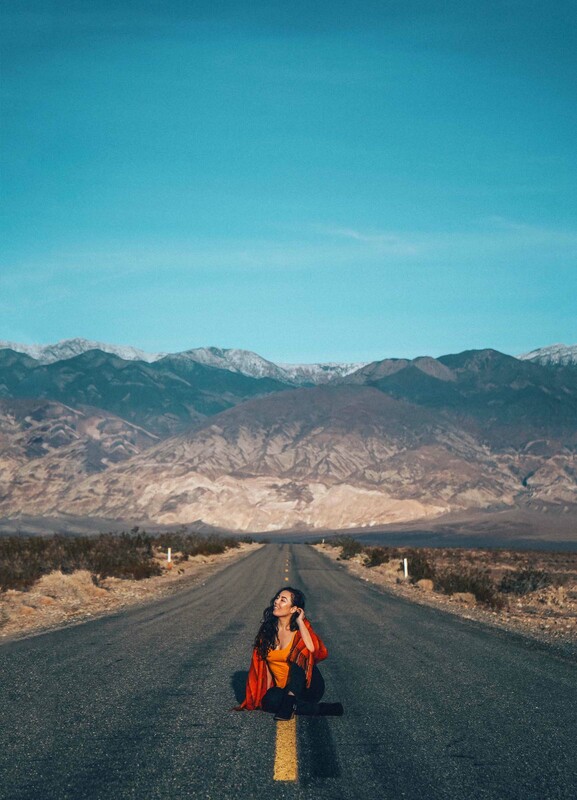 You should definitely make sure to budget enough time to get here, as embarking on a trip to Death Valley is akin to doing a long desert road trip! You will have patches here in there where bars magically appear on your cell phone and you can actually make phone calls and check emails. All in all, however, you’ll find that driving through Death Valley will mean that you’re mostly off the grid. Given this, I would advise that you make sure that you download offline maps or plot out your stops ahead of time. Oh, and maybe you should download a bunch of podcasts, audiobooks and music as well! Hotel and restaurant options here are limited, and you should research and book in advance. There are a few campsites (Furnace Creek, Mesquite Spring and Wildrose) and a few hotels (The Oasis, The Ranch at Death Valley, Stovepipe Wells Village and Panamint Springs), but our preference was to stay at a hotel, so we went with the adorably sophisticated and charming Inn at the Oasis. For food, let’s be honest, you’re not going to Death Valley to try some delicious desert cuisine. 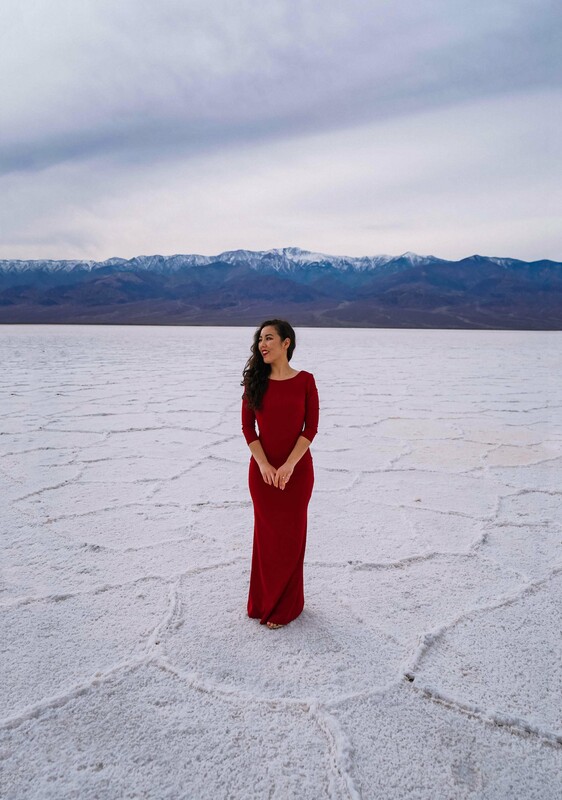 There are food options for sure; grab a drink at the Badwater Saloon, a nice dinner at The Inn Dining Room, farm-to-table fare at Amargosa Café, unique local Native American food at Timbisha Tacos or a simple burger or hot dog at the 19th Hole, aka the lowest altitude golf course in the world! However, good food is pricey, and many of the restaurants have slightly unpredictable hours. 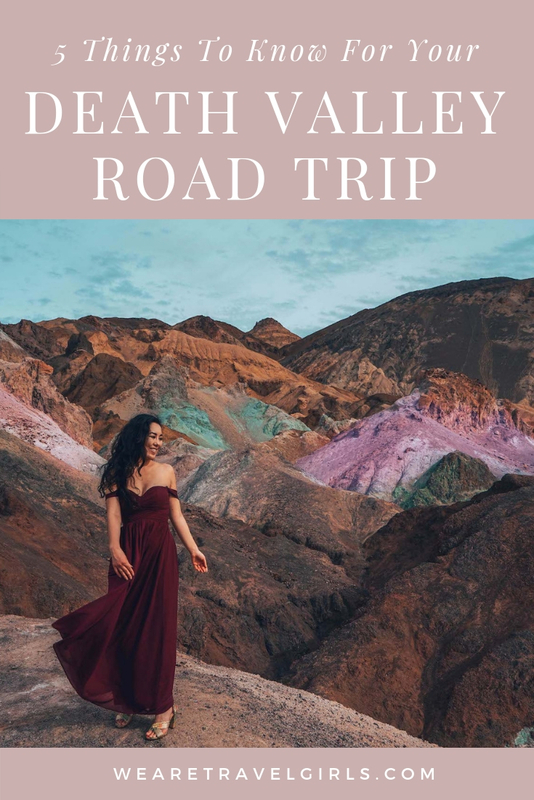 Whenever you set out on this road trip, know that you have options, but also just make sure to pack plenty of trail mix, dried fruit or other snacks! This is the part you’ve been waiting for. 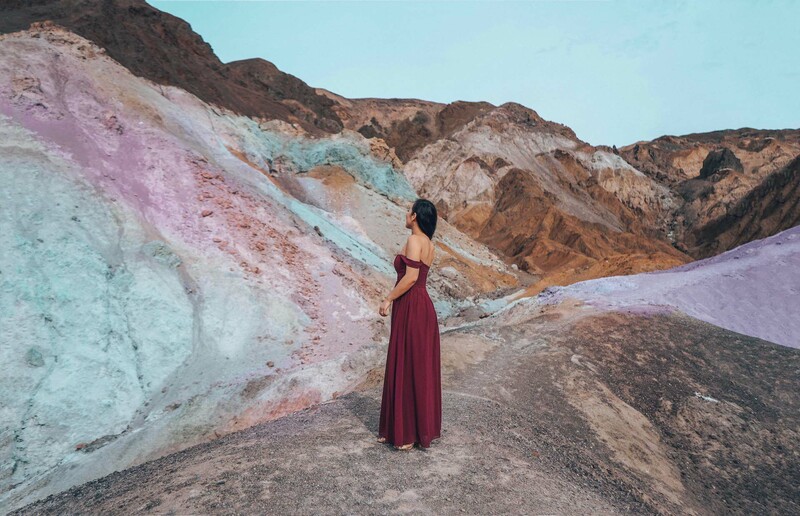 Death Valley has no shortage of breathtaking views, from sand dunes and salt flats to volcanic mountains and mining site ruins. Here are some of my favorite things to see. This quintessential Death Valley spot is easy to get to with a parking lot and a ramp that leads right up to the main viewpoint. The vista point was originally constructed by the Pacific Coast Borax Company in the 1920s and was named after Christian Zabriskie—the company’s vice president. It’s an incredibly popular photo spot for sunrise, but it’s beautiful at any time of the day. 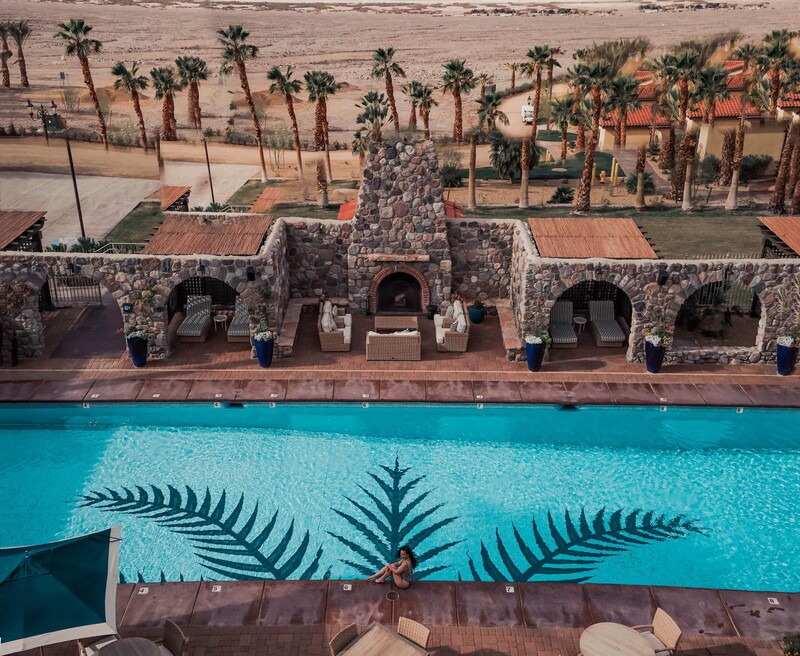 We went here twice when we were in Death Valley because of the ease of access from The Oasis, and it did not disappoint on either visit! Also, fun fact: Zabriskie Point is the destination featured on U2’s 1987 album “The Joshua Tree” (yes, ironically NOT from Joshua Tree National Park, although they did shoot there as well). 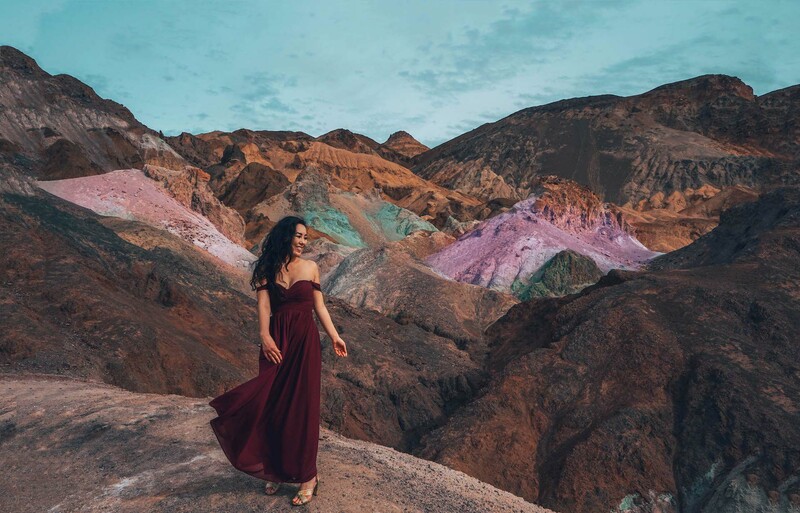 From Zabriskie Point, you can see many beautiful views in Death Valley, from the golden badlands to the cliffs of Red Cathedral and the vivid mountain range behind Artist’s Palette. Who says you need to go to Bolivia for beautiful salt flats? At -282 feet (86 meters) below sea level, Badwater Basin is the lowest point in North America, and once was thought to be the lowest point in all of the Western Hemisphere. It’s a bit of a walk via a wooden boardwalk to get to most beautiful salt-covered stretches of the basin but is 100% worthwhile. Because no water can flow out of the basin, it gets trapped and evaporates into the hot air, leaving behind salt mineral deposits that crack to form polygonal shapes. Supposedly, the basin gets its name from an unknown prospector who, while exploring the area in search of valuable minerals, tried to lead his mule to drink the water. After the mule refused to drink the salty, stagnant water, the prospector deemed the area “Badwater,” since it was not drinkable. One of the most fun drives you can do in Death Valley is along the Artist’s Drive. This 9-mile (14.5-kilometre) long one-way drive will take you weaving through colorful hillsides of green, white, yellow, purple, red and blue At the most popular point of the drive, there is a small parking lot that you can turn into to walk out to Artist’s Palette, where the most vivid colors are. The splashy and unique colors are formed by minerals oxidizing in the rock! Iron-rich hematite and oxides create the red/pink/yellow, mica deposits lead to tinges of green and manganese forms purple. 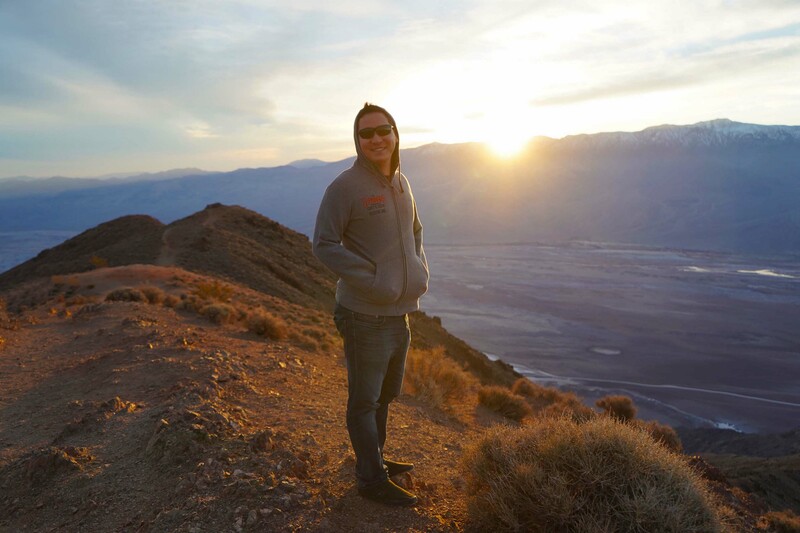 At 5,476 feet (1,669 meters) high, Dante’s View is one of the prettiest places to watch the sunset in Death Valley. Watching the sun disappear behind the snowy Panamint Range was a truly marvellous thing to see, and the view of the basin is also something to behold here. This spot was actually used as a shoot location to portray Tatooine in the 1977 “Star Wars” film! Other spots that we did not make it to but that I’ve heard are must-sees include the iconic Mesquite Flat Sand Dunes, the historical Keane Wonder Mine, the eroded and jagged rocks of the Devils Golf Course, remnants of a volcanic explosion at Ubehebe Crater and the beehive-shaped old fuel facilities of Charcoal Kilns. A lot of people prioritize Joshua Tree National Park and Yosemite National Park when they visit California, which are both incredibly beautiful in their own rights. But few places have surprised me as much as Death Valley did. 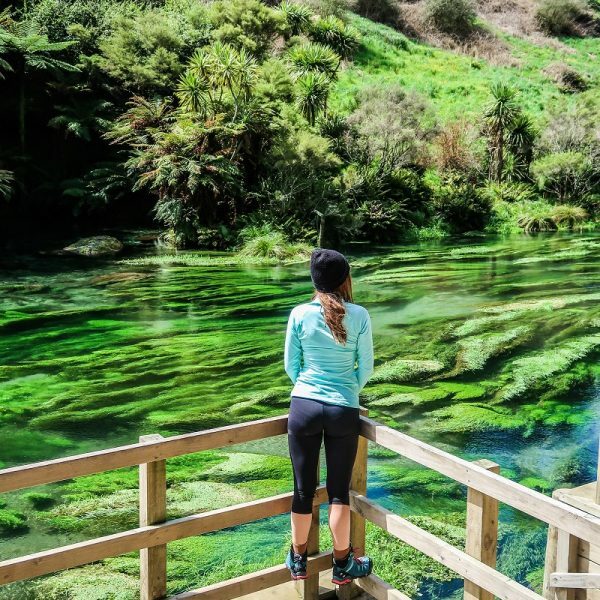 This otherworldly land of extremes will make you feel like you’re on a different planet and is well worth a weekend or even a weeklong experience. 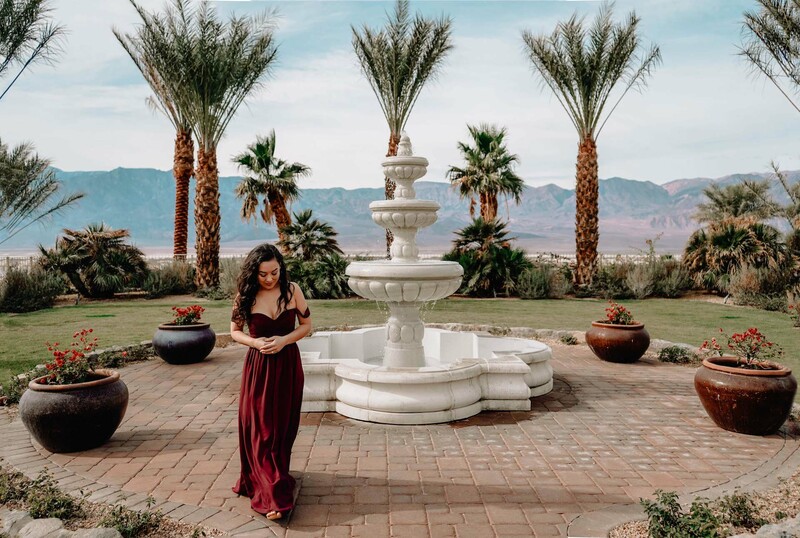 Come with your loved ones, see some wildlife (despite its name, Death Valley has a surprising amount of wildlife—we saw a few coyotes, and there are also bighorn sheep, tortoises, jackrabbits, plenty of birds and reptiles, fish and many more creatures! ), learn about some historical mines and embark on some beautiful hikes. Prepare for endless exploration and diversity of adventure when you visit—you won’t be disappointed! 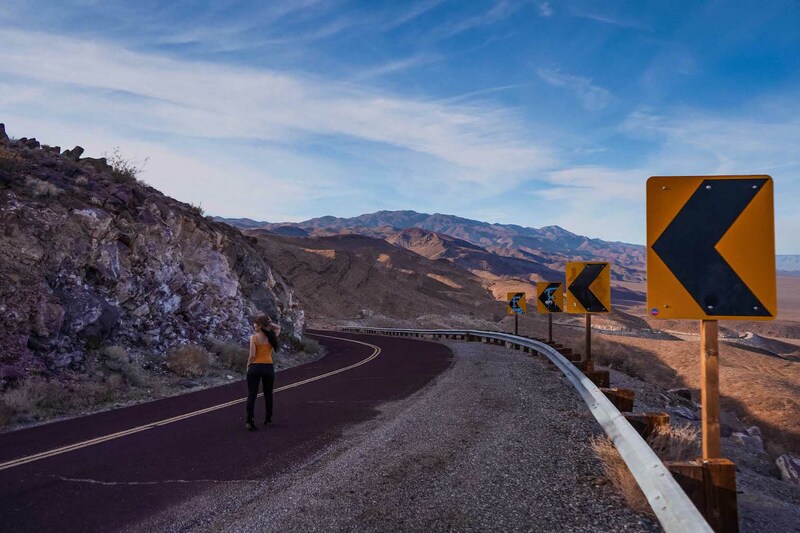 We hope that this article has helped inspire you to take a road trip through Death Valley. If you have any questions about the destination or have your own travel tips to share please leave these in the comments below.